UV LED Nail Dryer nail dryer is applicable to curing almost all nail gels! Its light is closer to white light, has no harm to eyes and skin. Ideal for both home and salon use. PROFESSIONAL AND CURING ALMOST ALL NAIL GELS: LED gels, UV gels, including Hard Gels, builder, sculpture gel, gem glue etc..No brand requirements though. Easy to use, just plug in and you are ready to go! FAST AND COMFORTABLE: It is low wattage but quick-drying. Quick and quiet, NO NEED ANY FANS! MULTI-FUNCTIONAL: For curing fingernail or toenail and with automatic sensor for curing. Let’s enjoy nail art at anytime and anywhere! 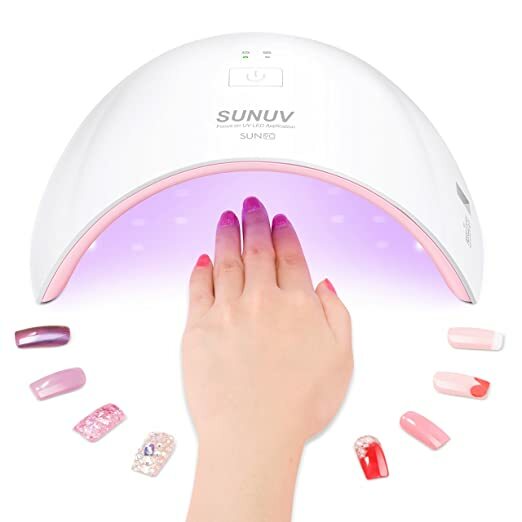 ALL-IN-ONE NAIL DRYER: With advanced professional designed UV+LED dual light source, UV LED Nail Dryer nail dryer is applicable to curing almost all nail gels! Its light is closer to white light, has no harm to eyes and skin. Ideal for both home and salon use.